I thought I was a fairly seasoned traveller, but a day spent recovering after the Australia versus Brazil match in Munich in the 2006 World Cup in Germany opened my eyes to a number of things which I would never have expected in a lifetime of exploring the nooks and crannies of Europe. Let’s start with the most bizarre sight of all. Surfing in Munich. The city is thousands of kilometres from the sea but there in a twenty-metre wide stretch of the Eisbach, an anabranch of the River Isar which flows through Munich, were a group of youngsters surfing on an artificial wave at the corner of the Englisches Garten (English Garden). You won’t believe it unless I show you a photograph I am sure. 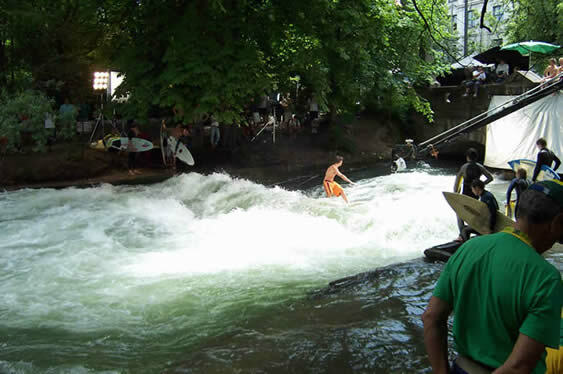 Surfing on the Eisbach in Munich. They recommend that you don’t swim in the river because of the pollution, but these guys were hanging ten and more and going for it. Control was vital for you were no sooner in the water than you had to do a 360. Most lasted only a few seconds, but there were one or two stars who probably could have done long, in terms of time not distance, runs.